This is the pre-peer reviewed version of the following article: Scherrer, P. , & Doohan, K. (2013). 'It's not about believing': Exploring the transformative potential of cultural acknowledgement in an Indigenous tourism context. Asia Pacific Viewpoint: specialises in the study of development, change and underdevelopment, 54(2), 158-170., which has been published in final form here. This article may be used for non-commercial purposes in accordance with Wiley Terms and Conditions for Self-Archiving. 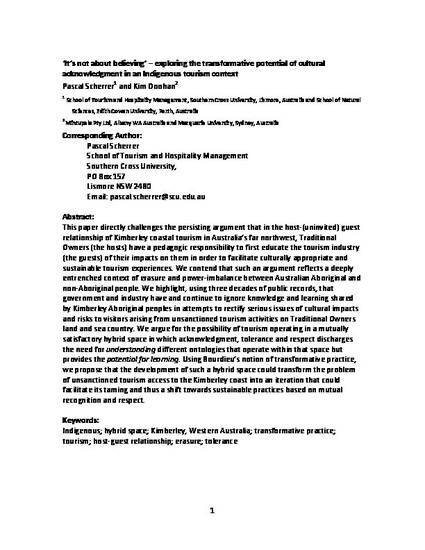 This paper directly challenges the persisting argument that in the host-(uninvited) guest relationship of Kimberley coastal tourism in Australia's far northwest, Traditional Owners (the hosts) have a pedagogic responsibility to first educate the tourism industry (the guests) of their impacts on them in order to facilitate culturally appropriate and sustainable tourism experiences. We contend that such an argument reflects a deeply entrenched context of erasure and power imbalance between Australian Aboriginal and non-Aboriginal people. We highlight, using three decades of public records, the fact that government and industry have ignored and continue to ignore knowledge and learning shared by Kimberley Aboriginal peoples in attempts to rectify serious issues of cultural impacts and risks to visitors arising from unsanctioned tourism activities on Traditional Owners' land and sea country. We argue for the possibility of tourism operating in a mutually satisfactory hybrid space in which acknowledgement, tolerance and respect discharges the need for understanding different ontologies that operate within that space but provides the potential for learning. Using Bourdieu's notion of transformative practice, we propose that the development of such a hybrid space could transform the problem of unsanctioned tourism access to the Kimberley coast into an iteration that could facilitate its taming and thus a shift towards sustainable practices based on mutual recognition and respect.